If you’re considering (or maybe have even decided on) a career in the fascinating world of stock brokering then you’re certainly at the right place. We know how confusing it can seem when you first start looking into becoming a stockbroker or even into getting a career in the wider financial sector as a whole. We’ve put together some great articles that we hope you will find both informational and entertaining to give you a head start. Despite what you may have been told by the well-intentioned but likely uninformed, it’s actually a really great time to start training for a stockbroker career. The reason for this is that due to the recent economic crisis and hard hitting pension scandals across the world, more and more people are looking to invest their savings in traditional stocks and shares themselves rather than through the more contemporary managed pension portfolio. Even though governments across the globe are backing and guaranteeing pension schemes, people are still extremely nervous about ploughing their hard earned cash into these schemes for fear that by the time they are of retirement age, the scheme or pension provider will have gone under and that successive governments will simply turn around and say that they haven’t got the funds to back guarantees made by previous governments and leaders. Although a good background on mathematics, finance or economics is generally a necessary pre-requisite to becoming a stockbroker, in truth, it isn’t actually that difficult a career in itself. When you consider the expense and duration of training needed to become a doctor for example (a profession that pays around the same as being a stockbroker) you can get a grasp of what we mean when we say that being a stockbroker is relatively straight-forward. If you can keep your head, not be ruled by your emotions, have some solid training behind you and be good with figures, there really isn’t much else that can stand in your way on your journey to becoming a professional, respected, licenced and successful broker of stocks and shares. Once training is complete, you will no doubt we hoping to sit the necessary stockbroker exams. In the US, there are actually two types of exams that must be passed before you can legally be called a stockbroker and be employed by a stock broker (the two word term is used to refer to the brokerage or company whereas the one word term refers to the individual, just in case you didn’t know). These exams are known as the Series 63/Series 66 exam and the Series 7 exam. As with most exams in life, they are far from impossible but without proper training, study and lots of preparation you will likely find them near-impossible. Even for the well trained and intelligent student stockbroker, we can’t stress enough that preparation for both of these exams is key. If you’re browsing this website, there’s a good chance that you’re interested in a career as a licensed stockbroker. The last thing we want to do is put you off but we feels it’s important to set expectations and make sure you realize what it takes and that the process is intense, demanding, and stressful. The right mind-set must be present when you decide on taking the career path to becoming a stockbroker as it is one of the most romanticized and idolized professions thanks to movies and TV shows. Wall Street and Gordon Gekko are the reasons many young people in the US are growing up with the desire to become a stockbroker. As brokers and personal advisors to the wealthiest people in the world, a stockbroker combines seemingly contradictory qualities to rise to the top of his game. Seeing young men and women trading on busy floors, stressed out but driving flashy cars, living in mansions and leading the ultimate glamorous lifestyle should not be the deciding influence when deciding to join a stockbroker training program. Rather, you should ask yourself: do you know what the requirements are, whether you need a degree, what subjects to follow in high school? What skills you should possess? Do you get different types of stockbrokers? How long do you have to study? A top stockbroker is a mixture of several professions; they are part managers, part marketers, part financial geniuses, and part salesmen. The rewards and challenges make it one of the most challenging and most rewarding professions and career options and the profession continues to attract thousands of young individuals every year. If your aim in life is becoming a stockbroker, you need to read this “how-to” guide as we believe it’s the most comprehensive material on a securing a career as a professional stockbroker to be found the Internet. Realize early on that you need a good or even above average education with a head for finance and mathematics. If figures are not your strong point, but History or Languages are, then quit while you are ahead. You need more than just a good head for numbers and good fields to excel in are business management, accounting, mathematics, finance, and economics. You need more than just a strong financial head as specific interests, traits and skills will make the difference between success and failure. Individuals with great number skills, who pay close attention to detail are always highly sought after in the business. Great communication skills to communicate detailed information in an understandable fashion is essential. Great initiative, self-control, and the ability to make informed decisions in a tough and competitive financial world is a must. Confident in your abilities is particularly important. There is no hard and fast rule stating that a degree is a requirement in becoming a stockbroker, however you will find entrance to several brokerage houses impossible without at least a bachelor’s degree. Individuals entrust their money to brokerage houses with professional stockbrokers who are qualified professionals so for an inexperienced stockbroker without a license it would be near impossible to reach the top, never mind to get a foot in the door even if you are great with numbers. Earning a bachelor’s degree in economics, business, accounting or finance with an emphasis on mathematics, or statistics is recommended and will really give you a head-start. Besides that, a master’s degree in business administration, finance, or a related subject will prove to be the right choice for higher salaries, career advancement, and job prospects in stockbrokerage. As a college student in finance, try to join relevant clubs and fraternities with like-minded students with the eye on stock trading. The aim is to communicate and network in the right circles, which can open doors to internships and entry-level positions at local brokerage firms while you’re still busy with your studies or upon getting your degree. As mentioned earlier, networking with people in the stock broking industry while getting your degree is important as it gives you a foot in the door, so to speak. Some companies offer in-house, on-the-job training while you gain experience and an understanding of the company’s products, services, procedures, and policies. Training in different departments within the company might be required in order for the employer and yourself to discover which department is more suitable to your skills and talents. Stock brokerage firms also encourage continued education depending on your experience and level of training. Upon getting your degree you would not walk into a stockbrokerage and trade, since a stockbroker needs to be licensed to practice. The mandatory licensing tests must be completed and it requires a minimum of four months employment with a brokerage firm and a sponsorship from that brokerage firm. Paid start-up positions at brokerage houses are often hard to get so when you’re starting out as a trainee stockbroker it helps if you have at least some savings to support yourself in the early days. Most prospective stockbrokers often settle for internships without remuneration to obtain the required experience and they gain their real on-the-job experience and attend in-house classes which prepare them for the obligatory licensing examination. The employer registers a licensee applicant working as intern for the brokerage as representative with Financial Industry Regulatory Authority. The trainee has to pass the Series 7 exam, which is also known as the General Securities Registered Representative Examination. After working for a particular brokerage for the minimum mandatory period of four months, the applicant for licensing takes a six-hour test which is made up of 250 multiple-choice questions, the minimum accepted score of which is 70 percent. This is called the Series 7 exam, that aims to test the general brokerage knowledge of each individual and this covers annuities, mutual funds, stocks, bonds and many securities. The series 63 exam, Uniform Securities Agents State Law Examination that follows the Series 7, is shorter and requires a 70 percent pass rate and it covers different topics including business practices and transaction law. You have two options when you are a licensed stockbroker, starting out on your own or joining a brokerage firm. It is understandable that starting out on your own would be difficult and that a brokerage firm offers networking, training, knowledge, and prestige and all factors that are beyond value to all aspiring stockbrokers. Building reputation and getting a client list by starting out on your own would take years of trial and error and could leave you deflated and bankrupt early in your career, but if that’s what you want to do then far be it from us to dissuade you and you should always follow your dreams and remember that anything is possible. You should be prepared to move companies to join top brokerage firms and as most of the top firms are based on New York’s Wall Street you may wish to consider relocating. Job vacancies within the top firms are rare and when they do appear the recruiters are inundated with applicants but don’t let this put you off applying as even if you’re not technically as qualified or experienced as other applicants, there are your soft-skills and your personality that may give you an unexpected advantage in the interview room. We can’t stress enough that to get a foot in the door, referrals and networking are really important and can play a big role so as mentioned earlier, this is something you can do while in college. Your best option is to get an internship and at this stage, it is immaterial whether you are paid or not as in most cases, the pay will be low or nothing at all, but you will gain valuable experience and be able to impress with your skills in order to land a permanent position. Stockbrokers act as an interface between brokerage firms, stock traders and investors by conveying orders to buy and sell stocks and shares. A stockbroker requires an easy-going salesperson-like temperament as they interact with the clients over the phone and by email and it’s important that all parties feel relaxed and reassured. 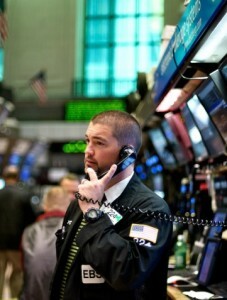 The main daily duties of a stockbroker are managing and servicing his client’s stock portfolio. When the client has a discretionary account, the stockbroker can technically trade stocks without consulting the client, but on the client’s behalf although in practice this is relatively rare outside of managed investment funds. Soliciting of new business and consultations with the brokerage firm’s research department to determine the best trades is an important part of a broker’s job and quite often the broker’s client will expect him to act almost as an all-encompassing financial advisor. As a stockbroker, you would spend a large proportion of your day keeping your clients informed on the variations of stock prices. A client would invariably be interested in purchasing particular stocks when it goes below a specific price or selling when it goes above a specific price and this requires a stockbroker to be extremely vigilant in monitoring fluctuations. There are plenty of opportunities in the financial industry for certified stockbrokers who are willing to work extremely hard, long hours. Modern day stockbrokers have several major areas in which they could build a business and even after retiring are quite often offered positions as non-executive directors of small to medium size businesses as it’s seen as being quite prestigious to have an ex wall-street professional on your board. A stockbroker’s compensation is made composed of both basic salaries and commissions so as you can imagine, this makes it a potentially incredibly well compensated and lucrative profession. According to payscale.com the 2015 salary for entry-level stockbrokers is an average of $51, 000, and around two thirds of that amount are straightforward commissions. Looking at the higher end of the spectrum a stockbroker could expect $146,000 or even more with around $110,000 in profit sharing and $20,000 in commissions. An Individual’s firm and geography will largely determine his or her income, however the biggest factor in determining a stockbroker’s salary is the level of experience they have. Ninety eight percent of practicing stockbrokers claim very high levels of satisfaction with regard to compensation regardless of whether or not they are being paid a fixed salary or whether their pay includes commissions. In 2015, the lowest salary for a stockbroker shows that only 10 percent of the registered stockbrokers are currently operating as an entry-level individual. Fifty percent of stockbrokers in the United States earn in the mid to high-level salaries of between $75,000 and $146,000. Most enjoy medical benefits and dental coverage too. Ten percent of stockbrokers earn above the highest level of $146 000 although even this is a significant proportion. Commissions are the most important and deciding factor of a stockbroker’s salary as it could be as low as $5,035 on the lowest pay scale for an entry-level professional and $546,311 for experienced and registered stockbrokers. Looking at salaries across the whole of the United States it is clear why many stockbrokers are advised that they might want to consider relocating to New York. 63 percent of stockbrokers earning in excess of $100,000 are working for companies whose head offices are located in New York. The current lowest market for stockbroker salaries is Denver, which pays 17 percent lower than the national average. Following the chart above it is easy to see what is meant here. An entry-level who just graduated is offered a salary below national average, and often would they not receive commissions as they might be placed as trainees in training programs within their prospective firms. The U.S. Bureau of Labor Statistics declared the annual stockbroker salary as $71, 720 in 2014, therefore even when a stockbroker works predominantly on a commission-only basis, it is one of the most rewarding financial services industries to be employed in. It really pays to keep your head down and work hard during the early years of your career as a stockbroker and when you eventually reach the top of the ladder, the sky is the limit. At this stage you probably can’t visualize flashy cars, palaces, and glamour, and the “Wall Street” dream but for a lucky few, this becomes reality. The Bureau of Labor Statistics shows that the top ten percent of US stockbrokers earn an average salary in excess of $187,000. After being in this pay bracket for a few years many brokers decide to go it alone and start their own firms. Owning your own brokerage firm can be exciting and extremely profitable but remember that these brokers gained extensive experience working in the field for many years and established themselves and built a large client base that is well established and clients are willing to follow them wherever they may go. If you reach your 10-year milestone you should expect an annual salary of well above $100,000. Statistics show that the 10 year average salary of a stockbroker is $120, 000 and you should be relatively young, especially if you went to college and obtained your MBA in finance straight after school. Stockbrokers reaching their 10th year in the field and specializing for example in mineral and metal wholesale statistically earn the most, with salaries of $182,000 and more. You have gained a level of success as you lived through the first five tough years and by now you have seen a dramatic increase in salary if you are in the right state and working for the right company. By now working at a low paying firm, you earn no less than $50,000, but you should sit in the bracket of $80,000 to $100,000 if you are within the national average. The best states to earn those types of salaries during your first five years include New York, Massachusetts, California and Washington DC. Unfortunately, if you live and work in Kentucky, you are living and working, thus earning the lowest salary for stockbrokers in the whole of the USA. The prospects for jobs and applications might often sound daunting but check out the current job listings and this includes listings that are advertised for trainee stockbrokers. Many states in the USA run websites listing the current employment vacancies across all sectors, including financial. If you do a quick search today you will see that there are many trainee stockbroker vacancies being advertised by major players such as LF Rothschild and HSBC. The salaries offered for the top jobs are the reason this industry is so incredibly competitive and why competition between jobs seekers is so intense. The job offers the opportunity to work in some of the world’s exciting and pulsing cities such as New York, Chicago, Tokyo, London, and many more. Brokers have the opportunity to experience various cultures and make a great living. Financial regulations within the brokerage industry continuously increase and in 2015, the financial giants expect a larger emphasis put on commodities trading and hedge fund trading and therefore traders with knowledge in those areas will be in higher demand than before. It is also expected that Baby Boomers would increase the demand for brokerage services, with more individuals retiring and opening a retirement account housing various stocks and shares. What lies ahead in 2015? A positivity surrounds the financial markets as they continue to improve and therefor a stockbroker’s salary should continue to increase as one of the best if not THE best professions in the financial services market. Aside from increased salaries and commissions, brokers will earn bonuses throughout the year based on how strong their firm is and how well their clients are doing. These bonuses are typically paid on an annual basis and often the bonus itself exceeds the yearly basic salary of an individual stockbroker. Stockbrokers work in excess of 45 hour per week to meet their client’s needs, but the financial rewards more than compensate for their efforts. Some brokers leave the field due to pressure or too much stress while others crave the financial freedom they gain and revel in the midst of uncertainty and excitement of everyday trading. Around the world, the financial industries occasionally experience tough times; this is predominantly due to housing bubbles and bad economic runs but the moment, the financial industries are recovering and there’s a definite light at the end of the tunnel. A nine percent growth is expected from 2015 and running through until 2025. This means more job opportunities and even better prospects for stockbrokers and traders. Employment rates for stockbrokers will rise at around 11 percent per annum. With the recovering economy, the demand for licensed and trainee stockbrokers is increasing and the experts are of the opinion that competition for any open positions will be fierce. It is now the time to get experience through internships, to achieve great grades in college and to get an MBA and the necessary licenses to compete in this competitive field. © 2019 CEcorp's guide to training as a stockbroker | Launching your career as a stockbroker today!